I liken the forthcoming general election to the World Cup; even if you don’t want to embrace it or like it, you have to care about it because it is everywhere. In Stillwater the streets are lined with signs endorsing a bevy of candidates who are seeking to lead us back to the American promised land. If you turn on the television you get bombarded with an array of commercials. (On a side note, I wonder how much good could done with all the money spent on campaigns? Maybe someone could pass a law saying whatever is spent on a campaign must also be applied to paying off the deficit.) Many people try to ignore the whole spectacle and they express their apathy or disdain for the political process by not voting. Some say that we should vote because it is a privilege of freedom that has come as a result of the price of brave men and women who died to give us the opportunity to be represented. 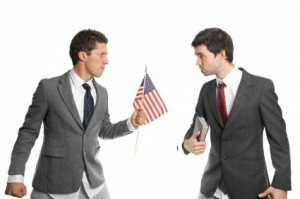 Currently, there seems to be a trend among Christians, especially among young adults, that politics and faith should have little or nothing to do with each other. Ed Stetzer has tweeted on Twitter, “When you mix politics and religion you get politics.” So what about Bible and politics? Does the Bible have anything to say about voting and what our involvement should be when local and national elections force their way into our cities, living rooms and minds? It seems to me that the Bible does give us a framework by which we can think about politics and make decisions on how to vote in a way that both honors God and is loving toward others (even when we are voting for “the lesser of two evils”). God and the human authors don’t dismiss politics and government in the Bible as unimportant, because all of life is important. God is not apathetic. The Bible shows that right thinking about God through Jesus leads to right thinking about all of life. Here are eight convictions that I try to act on as it relates to the Bible and voting. I am willing to critique and change a lot of what I have written below, but the one thing that I am not willing to do is to be brain dead and apathetic about my responsibility as a disciple of Christ when it comes to any part of life, including politics and voting. Rights and advantages provided by God through government and politics can be used for the gospel and for justice toward others. Paul in Acts used his Roman citizenship to advance the gospel by appealing to Caesar (Acts 25:11-12). Paul’s goal was to go to Rome and beyond to share the gospel and it was his appeal as a Roman citizen to go to Caesar that God used to get him there. Additionally, Paul is largely silent in regards to slavery but says in 1 Corinthians 7:21-22 that if a slave is able to become free they should do so. Paul used what was available to him and others when appropriate to his greater mission, the gospel. We should be careful with the expression of our political views. As has been pointed out by others, it is harmful to the cause of Christ and Christians to hold up hateful signs and write hateful notes and rail against politicians and people in the name of Christ. Christ did not do this, nor did Paul or any of the other writers of the New Testament. We can disagree with people strongly, but we ought to do so with love and tact. We should vote as though we weren’t voting. Click on this link to read John Piper’s application of 1 Corinthians 7:29-31 Let Christians vote as though they were not voting. Realize the benefit of being politically informed as opposed to politically ignorant. It probably isn’t a good idea to watch hours of FOX News, CNN or CSPAN but it is a good idea to watch some news and read a little of the newspaper so that the next time you are out “going” and meet someone you can use something popular like politics to talk about the hope you have in Jesus (1 Peter 3:15). A lot of people might not care about Jesus or see him as relevant to an election, but perhaps engaging people where they are will turn into an opportunity for the good news of Jesus to be shared in a considerate and loving way. Remember that God is sovereign and supreme over everything, including politics. I often say things like this and then wonder how it is true, but the Bible is clear that God reigns over the good and the bad and that somehow he uses undesirable things to bring about good things. In Romans 12:14-13:17 Paul gives instruction to bless those who persecute you (12:14) and then in 13:1 says that God establishes governments and there is no authority except that which is from God. These statements give me cause for pause because historically we know that it is the government that does the persecuting. Tradition holds that Paul was executed by Nero, the emperor of Rome. By the providence of God, Nero came to powere and Nero killed Paul. We may not like what we get on election day, but God is in control and we ought to respond and live like it is true, because it is, lest we resist God himself (Romans 13:2). God will one day right every wrong by every person, including politicians. Paul tells us that it is not our place to carry out vengeance because that is God’s to do because He alone is just (Romans 12:19). I must trust God and His promises by living responsibly and warning people about the wrath to come for those who are not in Christ Jesus (Revelation 19:11-16). No politician or government can save a person from their sin, so let everyone of us who believes in Jesus use politics as an opportunity to advance the kingdom of God as is fitting and to love others with the truth that Jesus died for all who would call upon the name of the Lord while they are sinners. Wilberforce was right to think that a person’s righteous behavior is the outflow of a changed heart and right thinking. We can tell people they ought not to kill babies or steal from the poor, but until they know why and are changed from the inside-out, morals will only wither and decay. Lasting morality is the result of a new creation (2 Cor. 5:17), and unless God changes the hearts and minds of people we are only delaying the inevitable reality of eternal separation from God. But let us not think that the fight for justice and morality is wrong or unwarranted. We certainly would not write off the efforts of a man like Wilberforce as stupid or pointless. After all, Wilberforce gave his life to the abolition of the slave trade in Great Britain from 1787 to 1833. He was defeated in this attempt eleven times and only gained the decisive victory three days before he died in 1833. But he is right, low morality comes not from lack of laws but from not having the heart changed by the power of the gospel. So vote. Exercise rights and privileges that so many in this world long for in the ability to vote, but may our priority be to put your hope in God through Jesus. He is the one that brings lasting change and justice to every person who believes. Editor’s Journal: A modern Reformation?